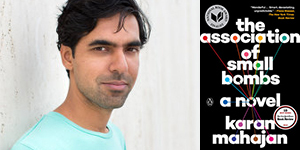 Viking and Penguin Books are thrilled that Karan Mahajan’s THE ASSOCIATION OF SMALL BOMBS has won the 2017 Anisfield-Wolf Book Award for Fiction. Henry Louis Gates, the chairman of The Cleveland Foundation, announced the winners of its 82nd Annual Anisfield-Wolf Book Awards on March 23. Since 1935, the Anisfield-Wolf Book Awards have promoted and honored books that have made important contributions to our understanding of racism and human diversity. Congratulations to Mr. Mahajan and everyone involved with the success of this exceptional book. THE ASSOCIATION OF SMALL BOMBS is an expansive and deeply humane novel that is at once groundbreaking in its empathy, dazzling in its acuity, and ambitious in scope. Mr. Mahajan writes brilliantly about the effects of terrorism on victims and perpetrators. The Anisfield-Wolf Book Awards will be presented to this year’s winners at the State Theatre in Cleveland, hosted by the Cleveland Foundation and emceed by Jury Chair Gates on September 7 as part of Cleveland Book Week. Mr. Mahajan is also a finalist for the 2017 New York Public Library Young Lions Fiction Award. For more details, read this Igloo article: Our Two 2017 NYPL Young Lions Fiction Award Finalists.